Wampler's relationship with Brad Paisley goes back to a time way before his original signature Paisley Drive pedal. In fact, thanks to the way it produced similar tones to the lauded Nobels ODR-S with more control for fine-tuning his sound, the first Wampler pedal Brad fell in love with was the since-discontinued Underdog overdrive. 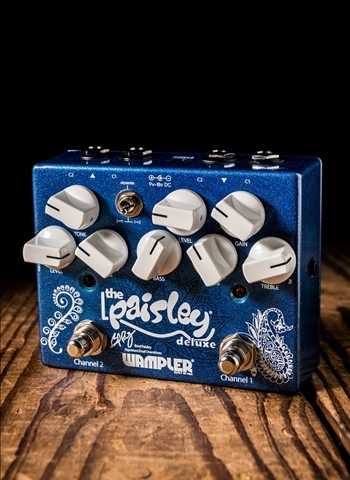 It's with this in mind that Wampler combined Brad's two favorite Wampler tones in the Paisley Deluxe dual overdrive pedal. By cramming a Paisley Drive and Brian's Underdog circuits into a single pedal, Wampler is delivering the ultimate Brad Paisley pedal. Not only do you have independent access to both tones, but you are able to stack them for more harmonically rich drive in any order you want. And taking a cue from Wampler's popular Tom Quayle signature Dual Fusion's groundbreaking signal routing, you're able to run each side of the Paisley Deluxe as an individual pedal, perfect for today's pedal switcher-based rigs. Whether you're looking to nail Brad's gorgeous signature tones or are looking for a great-sounding overdrive with unbelievable flexibility, you can't go wrong with the Wampler Paisley Deluxe.